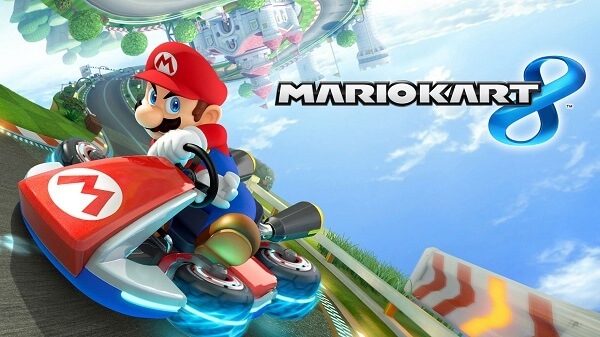 Mario Kart 8 is definitely the King of karts – good luck trying to dethrone this beast. It’s a super-fun kart racer that builds on top of the 22-year old franchise with new and intriguing ideas. 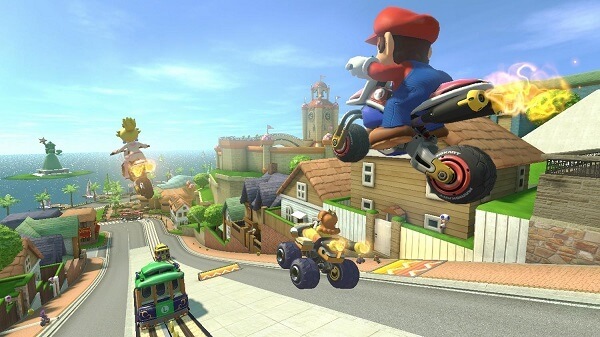 It doesn’t experiment as much as Double Dash, and, understandably, Nintendo hasn’t taken a big risk with Mario Kart 8 Wii U, yet all of the crucial elements that made its predecessors fun, are arguably better and more enjoyable. That awesome sense of speed while you rocket past another driver, beautifully-designed tracks, and a variety of online features, paired with scrumptious graphics make Mario Kart an essential title to play if you own a Nintendo Wii U. There is no version of this Mario Kart for the 3DS, unfortunately, as there has always been only one Mario Kart per console/generation. Nintendo released Mario Kart 7 for the 3DS, if you plan on playing some kart action on Nintendo’s lovable handheld system. Unlike past titles, characters and vehicle parts can be unlock quicker, and Lakitu will help you recover much faster than before. New items such as the Boomerang Flower and Piranha Plant are one of the most useful and powerful abilities you’ll find, but they don’t destroy the game’s rather delicate balance. 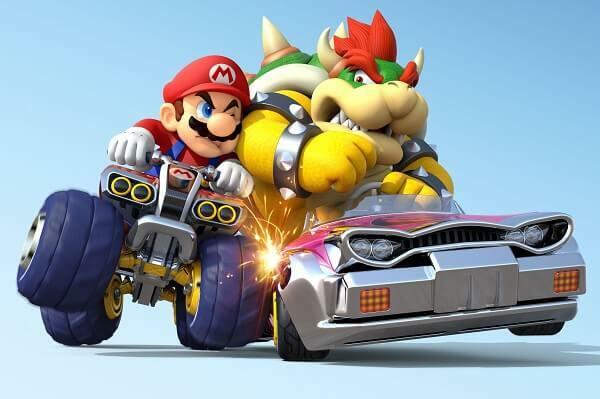 The new Super Horn will stop the pesky Blue Shell, and turns the new Mario Kart into a game that relies more on skill, rather than on filthy luck – I don’t think there’s a single gamer that has played Mario Kart who hasn’t raged over the Blue Shell mechanic. The best improvement to the franchise is the subtle, yet important antigravity transformation. If you ram nearby opponents while you are in antigravity, you can give them a pretty huge speed boost, so be careful from what angle you’re coming from. While Wario Stadium, and a few other tracks, is the perfect stage to overuse antigravity and have a ton of fun doing so, redesigned old favorites, such as Donut Plains 3, tend to rely on kart racing skills rather than on gimmicks. Shortcuts feel risky, as you don’t really know if you’ll get the upper hand or fall behind of the group – and it’s great that you don’t automatically know that you’re ahead of the herd. It brings more enjoyment to every race. The are 30 characters in the rooster, which is not bad at all, and Mario Kart 8 offers a wide variety of mascots to choose from – like the kooky Koopa kids. However, there are too many babies that swamp this installment that feel too much like their bigger counterparats. This comes as bleak and lackluster, as more obscure character like Nabbit or Dry Bones would have been more welcomed rather than mini-mes. 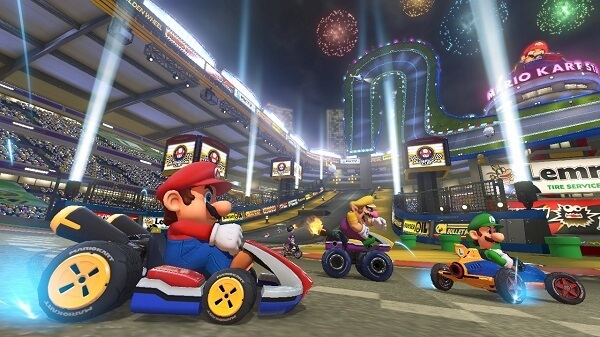 But the new Mario Kart offers a huge selection of modes and options to play with – there’s the default single player setting, and the greatly appreciated, but rather scarce nowadays, two-player split-screen option. Both settings roll at gorgeous 60 fps without a single drop – at least, in my experience playing Mario Kart. As expected of Nintendo, you can even play, locally, Mario Kart 8 with 3 or 4 players on the screen. Even though fps is halved at 30, it runs smoothly and it continues to look just stunning. To be frank, Mario Kart 8 seems to have the best graphics I have ever seen in a Nintendo-made game. Don’t know how much more devs can push the console’s capabilities, but I’m rather pleased with the results so far. Going to the online part of the game, you’ll see that it supports up to 12-players. 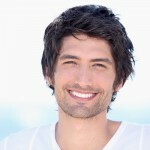 You won’t wait too long to join races and setting up tournaments is super easy. You can even upload the highlight video reel to YouTube. However, as is per Nintendo’s conservative attitude towards multiplayer gaming, the chat function is limited to lobbies with friends. There’s also no option that let’s you invite friends into the game, and the title doesn’t provide any sort of message notifications. Really disappointing, because you don’t have any means to organize with players before or during a match. Jump on Skype or Ventrilo instead. It has small disappointments that don’t obstruct the overall fantastic gaming experience, but they are worth mentioning. We would love for Nintendo to enter the modern-gaming era by adding more features that help with communicating with friends and, why not, even strangers on the internet. Overall, Mario Kart 8 is a fantastic game that we, the GameGuideWorld crew, recommend. You can buy the game from Amazon from Amazon right now!